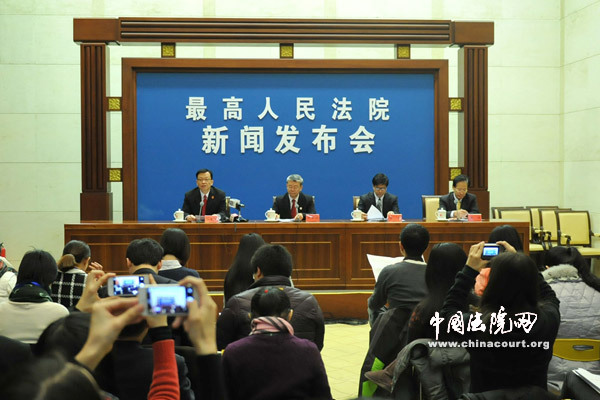 On the afternoon of 6 January, the Supreme People’s Court (the Court) issued its first judicial interpretation of the year (法释〔2015〕1号), its long-anticipated environmental public interest litigation interpretation at a press conference, at which officials from the Ministry of Civil Affairs and Ministry of Environmental Protection, as well as the Court’s spokesman appeared. The text of the interpretation is found here, with a translation available here (many thanks to the team at Chinalawtranslate). as well as a notice jointly issued by the Court, the Ministry of Environmental Protection, and the Ministry of Civil Affairs (the translation of the notice (now in progress, is available here). The Court published the text of the press conference, the video of which is available on the national court website. Barbara Finamore of the Natural Resources Defense Council and I are drafting commentary on the interpretation in tandem. My blogpost will summarize the highlights of the interpretation, the legal and policy background, as well as my assessment of what can be expected. A draft of the interpretation was issued for public comment in October. From the brief summary of the major differences available here, it is clear that the public comment period provided very useful input. This entry was posted in Environmental law.